The Parliamentary break is effectively over as Ottawa Hillites are speculating about the future of the government, of Stephane Dion’s career and, of course, about a future election which would significantly affect both. The traffic levels at Blogging Tories shook off the relatively low summer numbers on the night of the Quebec by-elections and traffic patterns are back up to normal as they were prior to the break. While Parliament has not yet resumed, everyone is hungry for politics. Everyone, that is, except for the Canadian electorate. Just as I laughed when the Liberals said it back when they had a minority government, the other day I had to chuckle when a heard a Conservative tell a reporter on TV that “Canadians don’t want an election right now”. For people that watch politics, an election is like the Olympics; an election only happens every two years and it’s what the political junkie lives for, and what their “heroes” train for. Politicians and reporters can easily find themselves out of touch with the Canadian reality as they try and match Wellington st. with Main st. Do Canadians want an election right now? It’s pure speculation. However, we can be sure about a few things concerning this fall in politics. First, the Liberal leader Stephane Dion and the Bloc leader Gilles Duceppe came from quite a beating in those Quebec by-elections a couple of weeks ago. Despite this, Duceppe has released his demands for the throne speech including some particularly difficult requests for the government to meet including the withdrawal of Canadian troops from Afghanistan and the cessation of federal spending powers in Quebec. Some say that Duceppe is staking his priorities against Harper to show that the Bloc is the real champion of Quebec’s interests when the Prime Minister inevitably turns him down. As for Stephane Dion, it is pretty much assured that the professor doesn’t want to fight the Prime Minister at the moment. The Liberal party lacks momentum, especially in Quebec, a traditional stronghold. Dion has also made some lofty demands of the Prime Minister including a similar demand for withdrawal from Afghanistan after February 2009, and a promise to keep the Liberals’ controversial private members bill on Kyoto alive. If the Prime Minister balks at a clear position on both, the Liberals for their sake will at least have two wedge issues to run a campaign on. Despite this, Dion must not be particularly excited about his prospects. If anyone around him is telling him privately that they are excited about an imminent election, he should fire them now. Dion still has a lot of building (and recovering) to do if he is to even crack Harper’s incumbent seat total, not to mention score a weak minority. As opposition leader, Dion will not vote for the throne speech, but it will be difficult to abstain from it as well as such a move plays towards the “not a leader” narrative and the Conservatives will capitalize on this. Likely, the plan for Dion is to show up, make a symbolic vote against the government but ensure enough of his MPs “have the flu” as would be needed to allow the renewed mandate of the government to pass, but allow him to save face with Canadians. However, if we see too many Liberals show up to defeat the government’s throne speech, it may be a sign of Ignatieff and Rae supporters showing up to eject Dion via election. Pundits will say that Dion couldn’t count that day, however, it may be indicative of some Liberals ready to push Dion on their own sword. We haven’t been hearing too much from the NDP regarding their demands for the throne speech and I think that this is indicative of their intent to support the government. Layton may have realized that with newly acquired momentum from Outremont, there’s more wedging to be done with the Conservatives to gut the ambiguous Liberal middle both left and right. Did anyone else catch this editorial by one of Ottawa’s most respected news veterans? Prime Minister Stephen Harper has gone out of his way to let the reporters in the Parliamentary Press Gallery who cover him know that he doesn’t care very much about what they think. Uh oh. PMO vs. Parliamentary Press Gallery politics was so early summer 2006, non? Don Newman seems to lament that Stephen Harper and Ottawa reporters were born in different pods. Besides, it’s Stephen Harper’s job to run the country. It’s the PPG’s job to care about what Stephen Harper thinks, not the other way around. When he arrived in office with his minority government in 2006, Harper immediately had his communications staff tell the Gallery he would not hold news conferences in the theatre in the National Press Building. Never mind that every prime minister from Lester Pearson to Paul Martin had used the theatre to meet the press, along with a host of politicians, dignitaries and other notables. Even one of Harper’s heroes, Margaret Thatcher, held a news conference in the National Press Theatre during an official visit to Canada in the early 1980s. No, Harper wanted to meet reporters in the foyer of the House of Commons, with the Chamber doors open behind him and Canadian flags in the background. A better visual image on TV. And if it looked a bit like the White House, so be it. Yep, it seems we’re going there. As a veteran newsman, Newman knows that nothing appeals to his type of Canadians more than reductio ad americanum. What is Newman criticizing here? That the builders of Parliament made the foyer and House look like the White House from a certain angle, or that our Conservative cowboy Prime Minister chose it. From one angle, we see the House of Commons. From another (which bends around a few planes of reality), it’s the White House. But the change of venue wasn’t the cause of friction between the Prime Minister and the people who cover him. At Prime Ministerial news conferences in the Press Gallery Theatre, the President of the Press Gallery is the chairman of the event. The President is elected for a one year term by his or her peers. And the Prime Minister’s government was elected by the people of Canada. Who’s authority are we appealing to here? The Parliamentary Press Gallery – and by extension, its President – are not elected by the people of Canada, does not exist by any law or statute written or ratified by the people’s representatives in Ottawa (or any other jurisdiction). The PPG is a club, with limited and exclusive membership. Questioners are selected on a first come basis as they identify themselves to the President. This would seem fair, however, first and foremost it would seem that a press conference is a consensual affair entered into by two (or more) participating parties. Further, the President and the gallery doesn’t recognize anyone outside of the club. The Gallery fashions itself as the gatekeeper to access to federal politicians in this Canadian Parliament. I remember reading of a time when freedom of the press was something that some journalists fought for. They used to fight for access, now they control it. yeah, he went there. But let me take this opportunity to contrast the “old world order” that Newman is accustomed to with that which exists today. Twenty-four-hour cable news, blogs, gaffe-amplifying Youtube, the online social network, and even Peter C. Newman’s hidden tape recorder are today’s norm. The Prime Minister may wish to limit access because the demand for access has gone up as reporters try to score the next “Puffin” piece to wedge between commercials for sit-down showers and CHIP reverse mortgages. a list of questioners is prepared by a member of the Prime Minister’s staff, from the names of reporters who indicate they want to ask a question. With control of the list, the Prime Minister’s staff can control who gets to ask a question. People the Prime Minister doesn’t like, or who ask tough questions, can be ignored. When the Toronto Blue Jays or General Motors holds a press conference, is it not generally run in the same way? There is a press secretary/liaison that calls upon journalists with their hands up. Oh, the lessons we learned in kindergarten. The teacher may not call upon the bratty kids, but knows that those kids/reporters will still act in a way or write what they like. this system after taking office, it was claimed the new approach was needed to provide more decorum around the Prime Minister. But formal news conferences by Prime Ministers have never been impromtu scrums. Reporters sat in theatre seats and only got to ask a question when their name was called by the Press Gallery president. solidarity! (but not forever, sorry). Isn’t the press supposed to be in Ottawa to observe? It seems that they are participating in politics. Dimitri’s a stand-up guy, I’ll have you know. and ask questions when he holds a news conference. Privately, friends and supporters of the Prime Minister admitted Harper wanted to limit the press because he believes most reporters were not sympathetic to his political programs. And he didn’t want to encourage any problems that might create. In some circles we call that hearsay. We finally learn of the Prime Ministers real motives and it’s backed up by private conversations? And pushed around or shut out, you might think that members of the Parliamentary Press Gallery would be attacking Harper at every chance they got. Pushed around, shut out, attacking! What an image of a violent struggle. But a funny thing has happened. Harper has received generally benign coverage. Why? Because Harper has abandoned or paid only lip service to most of the progams considered either controversial or far to the right on the political spectrum. Instead he has adopted entirely new attitudes on climate change, Quebec, and a number of other issues. Attitudes most in the Press Gallery think are more moderate, more mainstream, more “sensible” than his previous positions. It’s fantastic that our unelected, access-self-entitled, exclusive club of journalists in Ottawa have work-influencing and expressed opinions on policy matters and whether or not they are “sensible”. Those private conversations, Mr. Newman? Do you get the sense that the Prime Minister may have a point that his coverage extends beyond dispassionate and unbiased analysis? So it has fallen to Harper’s former employee at the National Citizens Coalition, Gerry Nichols and others in the Conservative movement, to point out and criticize what are clearly major policy reversals. Policy reversals his former allies say are the “Flip Flops” of Harper the Prime Minister. Harper just can’t win! He’s applauded for taking “sensible” mushy positions on one hand but on the other he’s a flip flopper on conservative principles and still draws criticism from Newman via Nicholls! For the most part, embattled as they are with Stephen Harper and his communications helpers, Parliamentary Press Gallery journalists have not raised the “Flip Flop” issue. “Embattled” is a press term that we hear when journalists believe that a news figure is in trouble (usually with their political party or the electorate). Since “embattled” is a subjective term, what happens when the press uses it to describe the Prime Minister’s relationship with itself? The Prime Minister may have changed his mind but if he now agrees with most reporters, that kind of a “Flip Flop” is clearly enlightenment. “Stephane Dion fails his first electoral test as Liberal leader as the Grits lose a safe Quebec seat. “Stephen Harper becomes the buffer against separatism in Quebec, a role traditionally attributed to the Liberals. Where dominoes fall in Quebec, vote-rich Ontario takes notice. Further to that point, Jack Layton’s leadership is secure for at least another two years. The man from Montreal promised to deliver seats in Quebec. He delivered one, but he’s got momentum. This Mulcair fellow may however be the MP that replaces Layton as leader. From most accounts, Stephane Dion is a nice guy. From the couple of times we’ve crossed paths and from what I’ve been able to observe, the man is a class act. However, if what is being reported in Outremont is true and there’s a movement afoot to undermine his leadership, it’s time to either bring down the hammer Chretien/Martin-style, fade away or, or… something. Unfortunately for him, with party unity still a real issue, and no easy option presents itself. Before the ballots were even counted, the truth came out last night: in the Quebec by-elections, this nice guy finished “last”. This certainly plays well for Stephen Harper and he is ahead on two majority elements today: Dion’s failing leadership and the redefinition of federalism in Quebec. While Quebeckers are rejecting Mr. Dion’s strong centralizing vision of the federation (even though he denied this characterization of Liberal federalism last night), nationals from la belle province are embracing Mr. Harper’s respect for regional identity and power. Further indication of this can be seen in the falling Bloc numbers. As I stated above, we may see a reconfiguration of Quebec politics along left and right rather than federalist/separatist as in the past. Progressive-minded Quebeckers that voted for the left-wing Bloc are realizing a real option in Jack Layton’s NDP, while the rest are electing to choose Conservative government MPs and a new respect for Quebec’s place in a united Canada. The end-game of this in the rest of Canada is of course to cut the ballot left and right, between the policy-principled NDP and Conservative parties, wedging the Liberals out. Canada’s privacy commissioner has been googling Google, and she’s raising concerns over the search engine’s new Street View web photo application. Jennifer Stoddart says many of the street-level images Google is making available on the internet could break Canada’s privacy laws. Street View isn’t yet available in Canada but has been expanding in the United States since being launched in May. Stoddart has written to Google, and Calgary-based Immersive Media – which helped develop the imagery technology for Street View – asking both companies to respond to her concerns. “I am concerned that, if the Street View application were deployed in Canada, it might not comply with our federal privacy legislation,” Stoddart says in a letter to David Drummond, Google’s senior vice-president of corporate development and chief legal officer. In case you haven’t seen Google’s Street View, here it is. You can get a street-based view of many major US cities. It’s a good thing that in Canada, we have a fantastic bureaucracy that protects us from… innovation. I suppose they better shut down Flickr too. And… any newspaper or tv station that publishes or broadcasts images from public places. This isn’t surveillance, these are single images. Of course, this topic brings up a good debate. Do we consensually sacrifice an element of our privacy when we go out in public? I’ve presented my view. What’s yours? There is a faux controversy brewing in the media and among Liberal bloggers about Conservative ads that ran in the last election. As all parties do during elections, money was transfered between the national party and regional candidates. Conservatives ran their air war well and it was merely one piece of the strategy that paid off for the party that would form government after the contest on January 23rd 2006. Liberals allege that local campaigns funded “national” advertising and that the national campaign funded local ads which were national-like. In the wake of this constructed controversy, Conservatives have responded by saying that “tag lines” in advertising attributed the ads to local candidates. The Conservatives also claim that ads tag-lined with the names of local candidates ran locally. The Liberals, however, contest this local claim and also challenge the content of the ads and whether they are local in scope. 407. (1) An election expense includes any cost incurred, or non-monetary contribution received, by a registered party or a candidate, to the extent that the property or service for which the cost was incurred, or the non-monetary contribution received, is used to directly promote or oppose a registered party, its leader or a candidate during an election period. Election expenses are incurred by local campaigns. Local campaigns bought local advertising to “promote or oppose a registered party, its leader or a candidate during an election period”. So, 30 seconds of dead air wouldn’t be allowed… but, a commercial promoting Stephen Harper and/or opposing Paul Martin is certainly allowed if it is paid for and tagged by the local campaign. The Tories have kept their noses clean by purchasing separate ad buys for the national and local campaigns (national ads purchased by the national campaign and local ads purchased by the local candidates). The Liberals may dispute the separate nature of the advertising purchases. Here’s a signed letter from the advertising company commissioned by the Tories during the 2005/2006 writ period. – Advertising buys for the national party were segregated from advertising buys for participating candidates. 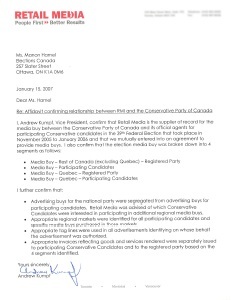 Retail Media was advised of which Conservative Candidates were interested in participating in additional regional media buys. – Appropriate regional markets were identified for all participating candidates and specific media buys purchased in those markets. – Appropriate tag lines were used in all advertisements identifying on whose behalf the advertisement was authorized. – Appropriate invoices reflecting goods and services rendered were separately issued to participating Conservative Candidates and to the registered party based on the 4 segments identified. So, the Conservative Party (national campaign) and the candidates (local campaign) were separately invoiced. It seems that all of the t’s were crossed and i’s dotted. Given that transfers of cash between local campaigns and the national campaign are perfectly legal, where’s the scandal here? Can somebody cite a section of statute or law that has been broken here? This article by Campbell Clark of the Globe and Mail describing Defense Minister Peter MacKay’s comments on Afghanistan on CTV’s Question Period this past Sunday, left me a bit unsettled and confused. OTTAWA — Canada has made it clear to its NATO allies that they cannot count on our troops to fight on the deadly battlefields of southern Afghanistan after February of 2009, Defence Minister Peter MacKay said yesterday. “The signal that has been sent already is that our current configuration will end in February, 2009,” Mr. MacKay said in an interview on the CTV television program Question Period. This is a clear step forward from the Prime Minister’s earlier assertion that a consensus in Parliament would be needed to extend the mission – in it’s current state – past February 2009. So, what is going on here? Is this what it seems? Is this surrender by the Conservative government on a key conservative principle? The more I thought about it, the more I started to think about this announcement in a strategic way. Afghanistan is going to be the wedge issue during the next election to take place when the government puts the mission to a vote in Parliament. The vote will fail, the opposition will indicate its majority intention to withdrawal from Kandahar and the government will fall, because Harper will make it a confidence vote. As it stands, 50% of Canadians support the current mission in Afghanistan while 50% of Canadians do not. Harper needs about 40% of the vote to get a majority government. MacKay’s announcement on Sunday does a few things. First of all, it indicates an utmost respect for Parliament as the mission and extension will still go to a vote (as indicated in Clark’s article). Secondly, it makes the opposition put down their guns on the Afghanistan issue for a while (continuous shelling of the mission puts it in a weak position in the forum of Canadian opinion). The opposition looks foolish when continuing to whine about the issue when the government has indicated that the mission (in the current parliamentary climate) cannot continue past February 2009. Third, it allows the government to prepare behind the scenes to sell the mission. The governing party has an advantage over the opposition parties in that it has two forums to spread its message, the House and outside of it. By indicating that the government recognizes that it is unlikely to win the Afghanistan mission vote, this disarms the opposition from consistently bringing it up in the House. Meanwhile, the government (the Conservatives) aim to sell it as an issue campaign across the country. While the government recognizes it is unlikely to win an extension in Afghanistan, the Conservative Party will still maintain the position that an extension is in Canada’s interests and will advance that position up to the vote. There is a bit of a dichotomy here: Minister MacKay concedes the realities of the government’s minority position on the policy, while the politics of Conservatives will continue to lobby for an extension. By playing government minister, MacKay disarms the House (because the House checks the government, not the Conservative Party). The Afghanistan extension is a perfect wedge issue for Harper. Only the Conservatives and the NDP have a clear position on the issue and only one can form government. The Liberals are bitterly divided on the issue. Ignatieff supports the mission in Afghanistan and Rae has indicated a tough on terror position in the past. Dion’s position is weak, somewhat against but certainly not for the mission. In fact, he has flip-flopped so many times in the past on the issue of Afghanistan. Of course, this plays into the Conservative narrative of weak leadership regarding Dion. Both Ignatieff and Rae are looking to topple Dion after an election, but concerning an extension as far away as 2009, this might be a wide enough window for both Rae and Ignatieff to act sooner rather than later. Harper’s strategy is to both create both a stronger NDP and a Liberal Party bitterly divided. What other issue creates these winning conditions? Afghanistan is a perfect issue to rally the conservative base, a reluctant group that has become angry over income trusts and only came out to vote in their champions in the wake of the biggest corruption scandal in Canadian history. Regarding Quebec, I’m starting to think that the media’s read on Quebec voting intention regarding Afghanistan are overblown. I think that more Quebeckers would get out to vote for the mission than get out and vote against it come election day. Quebec remains a puzzle though despite Harper’s continuous attention to that province. Speaking of which, Harper has also taken hits among the base for increased spending. Where, however, has this government spent? Childcare cheques, the military and transfer payments (fiscal imbalance) have been the shifted spending priorities of Canada’s New Government. The latter of which should help buffer some of that anti-military sentiment that the Toronto press believes that exists so pervasively in la belle province. Back to leadership, this issue favours Harper in an electoral footing. Because he has a better control of the timing of an election, he will obviously define a ballot issue that favours his government and personal leadership. Afghanistan is a red meat issue while the environment is assorted mixed greens. Defining the election on Afghanistan favours Harper’s strong grizzle-laden leadership style, while the weaker Dion will be left sitting in vinaigrette. Harper is not going to willingly contrast himself in an election on any other issue. The only thing green that the Conservative Prime Minister hopes to talk about during the election is Dion’s leadership and that Dion “doesn’t have what it takes”, “isn’t a leader” etc. I believe that Conservative strategists are counting on a majority coming from NDP gains (hoping to catch that unambiguous 50% against the mission) and the bottom falling out on the Liberal party on Afghanistan and Dion’s leadership. Having spent a number of years at a Canadian university, it can often feel that one’s wandering through a parallel world when it comes to politics. Rational thought and reason are often be replaced by misinformed emotional appeal. Even though modern liberalism is generally the status quo in this country, some students still feel that they go against the grain of mainstream society when they buy local organic groceries, attend a Naomi Klein lecture on American “Imperialism”, volunteer under the OPIRG umbrella of “activism” or have a “squat-in” to raise awareness about poverty as they huddle together in their MEC fleece warmed by their Venti Chai Tea Lattes from Starbucks. Anyway, I almost missed this but I found it heartening to see this release from my Alma Mater. It’s sure to ruffle a few progressive feathers and may inspire another student take-over of the principal’s office. Academic freedom is deeply enshrined in the culture of Queen’s University. Its core tenets – freedom in research and publication, freedom of expression in the classroom and freedom from censorship for speaking out – are basic to the university’s central purpose and ingrained in our history and traditions. The academic boycott of Israeli universities being considered by Britain’s University and College Union (UCU) is antithetical to the core value of academic freedom, which is cherished by Queen’s and other universities around the world. Freedom of inquiry and expression carries with it responsibilities – to encourage open debate and dialogue, and to listen to and learn from the views of others. We must defend these freedoms of speech and inquiry even as we engage with those whose views may differ greatly from our own. Contemporary society calls for leadership that respects but can also bridge social, cultural, economic and geopolitical divides. I therefore denounce the actions of the UCU and absolutely reject its approach. Those of us who devote ourselves to the learning and discovery that characterizes the academy must defend the freedom of individuals to study, teach and carry out research without fear of harassment, intimidation or discrimination. Accordingly, I join with many of my colleagues from universities around the world in stating that, if the British UCU pursues its ill-advised course, we will have no choice but to ask the British UCU to add our name to their boycott list. We are proud to align ourselves with those who deplore the UCU’s unacceptable attack on the values and principles that define us. As another school year starts, it’s good to see that the adults are still in charge and that the children… only win at sandbox politics. Posted on September 3, 2007 Author Stephen TaylorCategories OtherTags academic boycott, academic freedom, Israel, karen hitchcock, queen's, university and college unionLeave a comment on How refreshing!